In January, I finished up a powder room project for some awesome clients, and they were kind enough to share the "after" with me after the install - everything turned out absolutely beautifully! My clients happened to be local, so I asked if I could come by and snap some photos to share with y'all, and they said, "yes!" My goal in sharing this project with you today is to show that sometimes, small changes can make a huge difference in the look and feel of a space - even if it's not a big one! To give you a little backstory on this project, my clients live in a really cool one bedroom condo in an historic building in Philadelphia, and they've been slowly working on making it their own over the past several years. They're excellent DIY-ers, and have great instincts for what good design looks like, but wanted some guidance from a designer on how to bring everything together to achieve the look they had in mind. They also wanted to make sure that whatever they did improved not only their personal enjoyment of their condo, but also increased its resale value if/when they decide to sell down the road. After coming across Mix & Match in Philadelphia Magazine, and hearing about the concept of e-design, they thought that kind of service might be a perfect fit for them, and they were right - it turned out to be a great match! The bright blue paint was a little overwhelming, so we decided to tone things down with more neutral colors. Their builder-grade toilet wasn't working very well anymore, and they were ready to replace it with one that had a modern style that would fit in well with the look of the rest of their home. They also wanted to replace the mirror above the vanity and the fluorescent light fixture. Needless to say, I was excited about the idea of giving this small half bathroom a more modern, customized upgrade that didn't break the bank! The plan was to give the space a fresh start with gray paint, and add visual interest back in with an accent wall of tile behind the vanity. Since we were keeping the dark brown vanity and cabinet over the toilet, we wanted to balance those pieces out with some lighter elements. We chose a large, round mirror with an asymmetrical frame to compliment the square edges of the vanity and cabinet, and a new ceiling fixture with some bling. We toyed with a few tile options, but ultimately landed on a 2" polished Carrara marble hex tile* with light gray grout. It's so pretty in person, and the clients loved it so much, they ended up tiling the wall behind the toilet as well, which looks fantastic (told you they had great design instincts!). And because people always want to know grout color, we went with Polyblend #115 Platinum Non-Sanded Grout - it works beautifully with Carrara marble. The mirror is from CB2, and at 24" in diameter, it's a great size for this small space. The black crescent shaped frame adds just the right amount of whimsy. We actually did a last minute switcheroo with the toilet, and ended up with this one, which is very similar, but has a taller back piece. It looks awesome in there though, so if you're on the hunt for a modern-looking, dual-flush toilet, this is a great option! The last piece we changed was the light fixture - we swapped the not-so-awesome fluorescent one for this blingin' crystal flushmount. It's such a fun, unexpected element, and I give the homeowners all the credit for that inspiration! They had shared a photo of a fixture with a similar style when we were in the initial planning phase, and I'm glad we went that route. Such a change from where we started, right? Goodbye, bright blue, hello marble hex tile! I'm thrilled with how it all turned out, and so are the clients (which is the most important part anyway!). This bathroom is a prime example of how a few simple changes can make a big difference - you don't always have to do a gut renovation and start over completely. Another great part about this design is that it has mass appeal. If they do decide to sell down the road, this powder room will be a nice feature that many buyers will love. If you'd like to "get the look" of this little powder room redo, you can shop many of the items below. If you have any questions, or would like to work with me on a room in your home, send me a note - I'd love to help you out! If you're on a feed reader or receiving this in your email, you'll need to click over to the full website to use the tool below. Building on the theme from my post a couple of weeks ago on small changes, big impact, I thought I'd share a favorite small-budget project of mine from our home: the bathroom. (Some of y'all saw a shot of it on Instagram, and that reminded me that I haven't talked about the story behind it on here!) My goal is to show you that you can completely change the look and feel of a room without doing an ounce of major renovating or emptying your bank account - sometimes all it takes is a little thought and creativity (and sometimes a lot of elbow grease, but we'll get to that in a second!). When we bought our 1930s row house in Philadelphia a little over a year ago, we inherited a bright purple bathroom from the previous owners. Now, purple isn't inherently terrible, but this room was painted not one, but two shades of purple from top to bottom. It made our already small bathroom feel really tight and dark. Since it's our only (yep! only) bathroom in the house, it needed an update ASAP, and it was a top priority once we finished our other major updates in other parts of the house. Forgive the crazy lighting in that one! The two shades of poorly painted purple aren't doing this bathroom any favors, but if you can see past that, this space actually has good bones and features like beadboard, a pedestal sink, and that classic floor tile pattern. Gutting the bathroom and starting from scratch wasn't in the cards for the foreseeable future, so we chose to give the whole room a simple refresh with paint, update the sconces, and remove some of the clutter on the walls that was making it feel smaller than it is. Side note: if I was designing a bathroom from scratch, would I choose what's currently in there? Probably not - it's certainly not the bathroom of my dreams, but there are/were higher priority projects that we chose to invest in over a totally new bathroom, and I'm totally fine with that! The first step in this makeover was to get rid of all that purple. After priming, I used Behr Ultra Pure White on the beadboard and Benjamin Moore Winter White on the walls, which are the same wall and trim colors in the rest of in our house. I also took down the glass shelf by the mirror, the small accordion vanity mirror and the two towel rings on the linen closet doors to give the small space a more open feel. At that point, it was basically a blank canvas - time to bring some color and interest back in! Since the white mirror/medicine cabinet practically disappeared into the wall, I decided to paint it matte metallic brass from Modern Masters. This paint is amazing for projects like this. I love their colors and finish, and the metallic pigment is stellar. The color is Valspar's Gotham Gray. Depending on the light, it looks like a charcoal gray with some blue in it or nearly black. I love love the color. It ties into the small blue floor tiles really nicely without being a perfect match. One other minor change I made was with the sconces. If you look at the before photos, you'll notice that they point up and have more of a fluted glass shade. They looked a little dated and their placement was too high for you to see yourself well in the mirror. Instead of replacing them completely and moving the electrical boxes, I simply turned them 180 degrees so they pointed down, and replaced the fluted glass shades with some more streamlined, modern looking ones. It was a small update (all it took was time and about $15) that made a huge difference both functionally and stylistically. What small budget projects have made a big difference in your home? 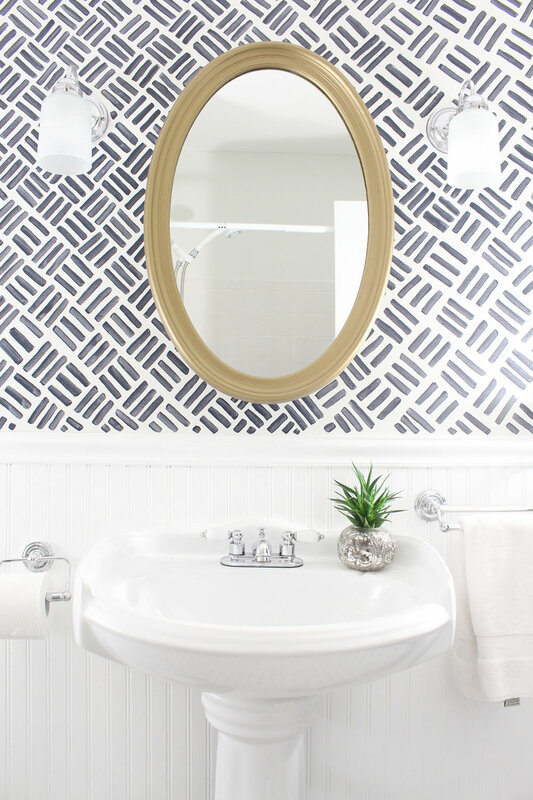 Catch a glimpse of my bathroom featured on Shutterfly's bathroom ideas page!